ST-EUSTACHE, QUE. – HGrégoire representatives say the group has added two new car dealerships to the growing network. The addition of HGrégoire Infiniti and HGrégoire Mitsubishi, both in Chomedey, brings the number of franchise locations in Québec to seven. The Mitsubishi dealership is a new point set to open in August. This brings the tally of new and used-vehicle dealerships in the HGrégoire fold to 17. Total cost for both stores has been pegged at nearly $35 million. “HGrégoire Group has the knowledge and expertise to provide Mitsubishi Motors customers with an exceptional and enjoyable experience,” said Tony Laframboise, president and CEO, Mitsubishi Motor Sales of Canada. 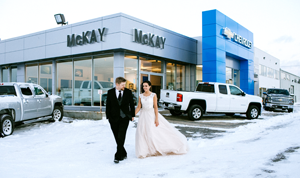 “We’re delighted they have joined our family as our 37th dealer in Quebec and the first to adopt our new dealer image program in the Greater Montreal Area,” he added. The move also marks another foray into the franchise world of automotive retail. Founded in 1993, HGrégoire made its name in used-cars with a network of pre-owned superstores in Quebec and Florida. Management moved into new cars in 2014 with the purchase of a Nissan store. The company now runs three Nissan points and represents Hyundai and FCA.